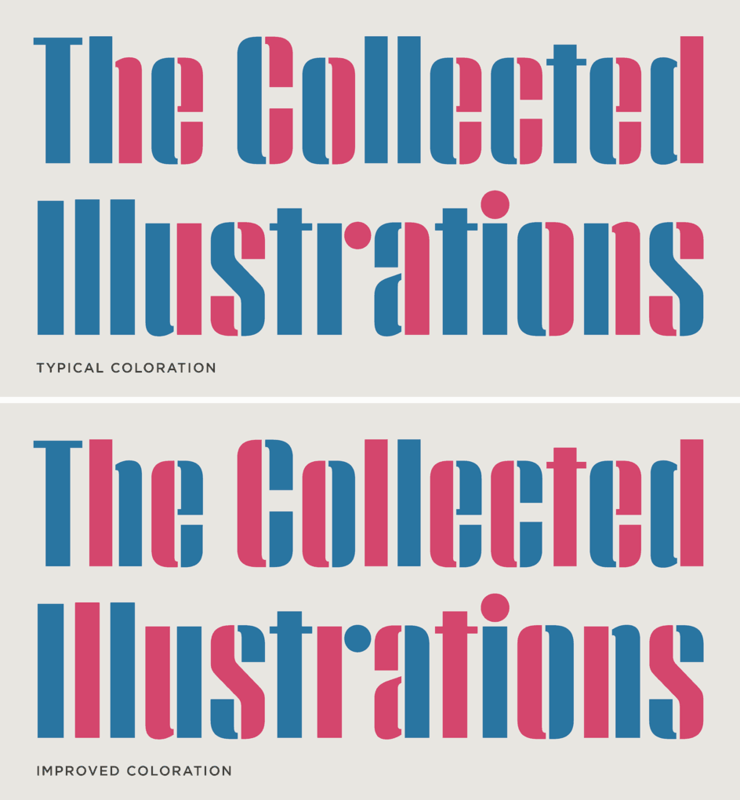 Peristyle Font Features: Color Balancing | Hoefler & Co. The bicolor Peristyle Stencil Layers fonts automatically adjust the assignment of colors from shape to shape, in order to maintain an even rhythm. The bold and abstract forms of a stencil alphabet naturally lend themselves to graphic applications, and because letters are usually divided into left and right halves, they invite the use of color to create a lively rhythm of alternating hues. With uses like this in mind, Peristyle Stencil includes a pair of fonts named Layer One and Layer Two, which can be differently tinted and stacked together in unison. But this is just the beginning. Things usually get tricky when letters don’t have two equal halves to color, in letters such as the capital and lowercase i, the lowercase t, l, and m — and, as you look to the greater character set, more than sixty other glyphs, including the figure 1 and the period. Without carefully managing which shapes get which color, typography quickly develops unwanted concentrations: above, the sequences Th, lle, te, Illu, str, and tio are overwhelmingly blue. Peristyle Stencil solves the problem by automatically reversing the color orientation whenever necessary, in order to maintain an even rhythm of color throughout the line, and better balance of both colors everywhere.